FFTF cofounder Holmes Wilson has closely followed Apple's long-running battle against government backdoors for some time, but Tuesday's court order mandating the company offer assistance in an ongoing FBI investigation was cause for action. 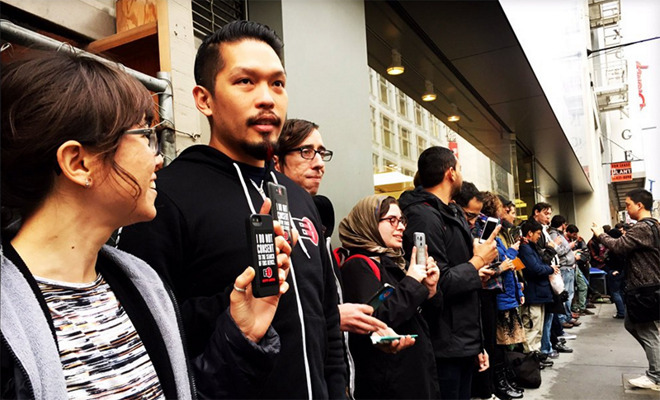 Wilson helped organize Wednesday's Apple Store gathering in which a small group of supporters brandished iPhones bearing an Electronic Frontier Foundation sticker reading, "I do not consent to the search of this device." "It began as a basic privacy issue, but the more we get into it, we learn it's a bigger issue about the future of online security," Wilson told AppleInsider. A federal judge on Tuesday ordered Apple to assist the FBI in unlocking a passcode-protected iPhone 5c used by San Bernardino shooter Syed Rizwan Farook. The request requires Apple create specialized software to bypass a passcode attempt counter in iOS 9, thereby leaving the device open to a brute force attack. Wilson said it's possible that the FBI is leveraging the high-profile terrorist case to push its own agenda forward. The law enforcement body, as well as other U.S. government agencies, have for months argued in favor of prioritized access to encrypted consumer data, and a federal court blessing to procure a first-party workaround is a major step towards that goal. "They have many, many other tools for getting this information, governments have never been in a better position to get data on targets," Wilson said. "We are living in the golden age of government access to data." Government players, including the White House, maintain that access will be limited to a single device, namely Farook's iPhone 5c, but Apple CEO Tim Cook is leery of those claims. In a letter posted to Apple's website mere hours after California District Court Judge Sheri Pym handed down her ruling, Cook railed against the FBI request, saying that coding a software bypass is tantamount to building a backdoor. "Up to this point, we have done everything that is both within our power and within the law to help them. But now the U.S. government has asked us for something we simply do not have, and something we consider too dangerous to create," Cook said. "They have asked us to build a backdoor to the iPhone." Perhaps more importantly, a government-sponsored action against strong encryption could set international precedent, opening the door for countries that hold little regard for public privacy to demand identical levels of access. For this and other reasons related personal privacy, security and digital rights concerns, Apple has vowed to appeal the matter to the Supreme Court if necessary. FFTF plans to hold additional rallies next Tuesday at various Apple Store locations around the U.S., and potentially abroad, set to take place at 5:30 p.m. local time.